Coaching the Frolunda Indians was an opportunity Ulf Dahlen just couldn't pass up. Yes, he loved his life as an assistant coach with the Dallas Stars, but the merits of being the big boss for a big-time Swedish club like Frolunda were too many to pass up. "It's been a lot of fun so far and I'm really excited about this opportunity to coach a team in Gothenburg, which is a big city, a great place to live and a great hockey town," Dahlen told NHL.com. "I really enjoyed Dallas and the opportunities I had there, but the more I thought about this, the more interesting it became." And it wasn't just about being home for Dahlen, who was born in Ostersund and played hockey in Sweden until joining the New York Rangers as a player in 1987. "We really enjoyed living in the (United) States," Dahlen said. "Being involved in hockey as a player or a coach, you are fortunate enough to spend the summers wherever you are from; so for us it was the best of both worlds. This was more about the opportunity to go from being an assistant to being a head coach. "I enjoyed working with (Stars coach) Dave Tippett and the guys on his staff. I learned a lot from them and wanted an opportunity to put that to use with my own team." Dahlen already has begun to do that as Frolunda kicked off its regular season last week with a close loss to the defending Swedish Elitserien champions, HV71. The team also did well in the Nordic Cup, a preseason tournament that pits the top five Swedish teams and top five Finnish teams in a round-robin tournament. Frolunda finished second in that tournament, losing the final to Linkoping, 5-4, on an OT goal by former NHL player Jan Hlavac. Early next month, Oct. 2 to be exact, Frolunda will play the Ottawa Senators in an exhibition match in Gothenburg. Ottawa will be tuning up for the Bridgestone NHL Premiere 2008 series against Pittsburgh in Stockholm, which begins on Oct. 4. "We feel pretty good about our team," Dahlen said. "We're pretty excited with the group we have here this season. We have some youth on our team that is going to see some time in the NHL soon, for sure. We also have a few guys that have been over there and have NHL careers behind them. It's a good group and we just need to get the guys to come together." Dahlen, a first-round pick of the New York Rangers in the 1985 Draft, is extremely excited to be working with Frolunda's young core, headlined by Lars Eller and Joakim Andersson. Eller, a first-round pick of St. Louis in 2007, has matured brilliantly in the Frolunda youth system and was expected to make big contributions this season. He was dinged up in Frolunda's first game, however, and his status for the exhibition against Ottawa is doubtful. He is expected to miss several league games, as well. But, when healthy, Dahlen says that Eller is already the real deal. 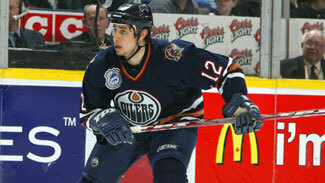 He also has high praise for Andersson, a third-round pick of Detroit in the 2007 Entry Draft. "Joakim Andersson can play either center or left wing and he is a really smart player," said Dahlen. The young players are also impressed with Dahlen, noting that he has traveled the path to the NHL that they hope to follow soon. "He's a really good coach," Eller told NHL.com. "He's been in the NHL as a player and a coach and he knows what it takes and he can help us out." Both Eller and Andersson see some North American facets to Dahlen's training regimen -- especially the shorter, more intense practices -- as well as his tactical outlook. Yet, Dahlen says he has not consciously brought a North American style to one of Sweden's most successful clubs. He points out that he has spent many summers in Sweden, has played for the national team and was involved in Swedish hockey at the management level before joining the Stars as a coach three years ago. "I think your philosophy on hockey is pretty much the same wherever you are coaching," Dahlen says. "But obviously the game is different on the smaller ice." But Dahlen also sees the North American game creeping in to the European game, which is routinely played on the bigger ice surfaces. "I think the North American style with the quicker game and going to the net hard is something that most teams -- even over here -- are trying to get put into their games," he said. Clearly, the Senators will be playing that style when they arrive for their exhibition, which comes just two days before they start the NHL season with a two-game showdown against Pittsburgh in Stockholm. Dahlen believes it will be an awesome show for those lucky enough to see it in person. Despite having to personally focus on the Swedish Elitserien season, Dahlen admits to the excitement building all around him as Ottawa's arrival draws closer. "For the people in Gothenburg, it's a big thing," said Dahlen, who noted that the return of hometown hero Daniel Alfredsson, the Ottawa captain, only adds to the equation. "Daniel Alfredsson is kind of coming home in this game and it is an opportunity to see one of the best teams in the world." And by following his heart to become a head coach of Frolunda, Dahlen gets to take center stage in what should be one of the biggest spectacles of the 2008-09 hockey season.